Head out to the frosty Arctic in four cool adventures where you help to decide how the story ends! Will you climb to the top of Penguin Island, or take a plunge to the frozen depths? It’s in your hands – um, flippers! In The Inventor’s Apprentice, Gary the Gadget Guy is creating an awesome invention to make the penguins’ lives easier – and more fun! You’re going to help him out… but will you come up with something truly amazing? Or will the project go terribly awry? 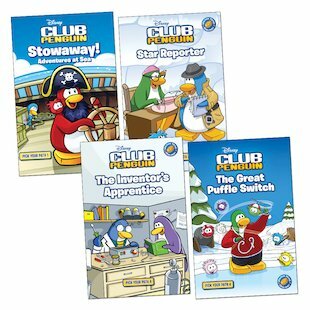 In Star Reporter, you’re joining editor-in-chief Aunt Arctic to go to work on the Club Penguin Times! But will you report on a party at the Iceberg or cover the big ice hockey game? How does it end? You choose! And there’s more fun in store when you head out to sea in Stowaway!, and magically trade places with a puffle in The Great Puffle Switch! 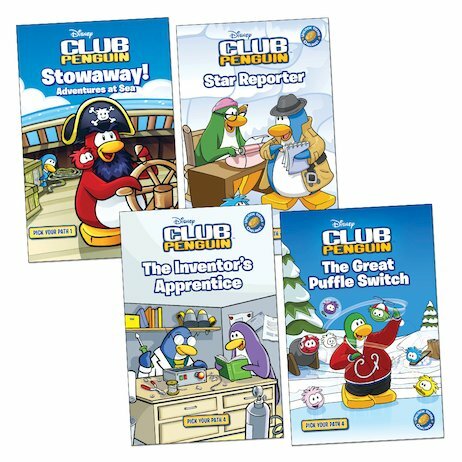 PLUS – unlock extra Club Penguin website items using the cool codes inside each book!